So, I guess we have just reached the tipping point, it's "privacy game over" for business travelers. For about 327 million of the 500, the breached data includes names, mailing addresses, phone numbers, email addresses, passport numbers (! ), Starwood Preferred Guest ("SPG") account information, date of birth, gender, arrival and departure information, reservation date, and communication preferences. The company said in a statement that it discovered "unauthorized access" to the database, which extended back until 2014. In some cases, payment card numbers and expiration dates were also taken, but Marriott said it's unclear whether the hackers have information to decrypt the payment card numbers. Marriott said it has set up a website for consumers impacted by the hack, at info.starwoodhotels.com, and a call center. "Call volume may be high, and we appreciate your patience," the company said. Starwood is sending an email to all addresses affected. Here is where the bad guys come in. You can expect a raft of phishing attacks that try to exploit this data breach, either by using just scare tactics, or by using actual data from the breach itself to make it look as real as possible. If you are a KnowBe4 customer, we strongly recommend you inoculate your users and send a simulated phishing attack to your users that uses this Marriott data breach as the theme. Two new phishing templates and a landing page have been added to our Current Events phishing templates category. Use them to prepare your users before the bad guys use social engineering tactics and trick them. Each template leads to a fake Marriott login page to mimic a credentials phishing attack. Grab these template and landing pages and send it to either all users, or if you have a Smart Group containing your frequent travelers, that would be the first priority. If you are not a KnowBe4 customer yet, we suggest you step your users through this free module that is available until the end of December 2018! “Safe Travels For Road Warriors" is a 12-minute animated course with lots of interactivity for those that travel for business—and some very helpful tips for personal travel too. Old-school awareness training does not hack it anymore. Your email filters have an average 10.5-15% failure rate; you need a strong human firewall as your last line of defense. Join us this week, Wednesday, December 5, 2018, at 2:00 p.m. (ET), for a live demonstration of how KnowBe4 introduces a new-school approach to security awareness training and simulated phishing. See the latest product features and how easy it is to train and phish your users. NEW Virtual Risk Officer shows you the Risk Score by employee, group, and your whole organization. NEW Advanced Reporting on 60+ key awareness training indicators. Send fully automated simulated phishing attacks, using thousands of customizable templates with unlimited usage. Train your users with access to the world's largest library of awareness training content and automated training campaigns with scheduled reminder emails. Active Directory Integration to easily upload user data, eliminating the need to manually manage user changes. Find out how 22,000+ organizations have mobilized their end-users as their human firewall. A crafty mix of social engineering, great timing, and context act as the perfect ingredients to trick unwitting users into buying gift cards and placing them into the hands of the attacker. At the end of the year, nearly every company is thinking about holiday bonuses, corporate gifts, and holiday greeting cards for customers. So, it’s not unusual to think that the head of an organization might want to give out some gift cards to select employees at this time of year. This all-too-common scenario is being taken advantage of by cybercriminals, according to the latest threat spotlight from security company Barracuda. Using simple impersonation tactics, the bad guys pose as the CEO asking an office manager, executive assistant, or receptionist to discreetly purchase some gift cards that will be used as gifts to employees. Using well-researched personnel details, these cybercriminals are able to identify an appropriate individual to target, send them an email from the CEO’s supposed personal account, implying a sense of urgency to move the victim to act. They are filled with contextual goodness – these attacks get so many details right: the CEO’s name, the recipient selected, the time of year, and the reason for the gift card purchase. In an employee’s mind, this is all very plausible. There’s no malware – this is a malware-less attack, with no links or attachments for an AV or endpoint protection solution to spot. They leverage the power of the CEO – this is important. When the CEO says jump, generally people say how high? The fact that the request is coming from the CEO is usually sufficient motivation to make the recipient comply. Process – anytime a request is made to purchase something over a certain amount via email, a phone call should follow to verify the request. Education – users that continually go through security awareness training should spot this a mile away. The email details and the abnormality of the request are red flags to a user with an elevated security mindset. Users that step through security awareness training are educated on the scams run, tactics used, what to look for, and, generally, to maintain a state of vigilance when it comes to their interaction with email and the web. This impersonation attack is simple but effective. Protect your organization by enabling your users to be the last line of defense in your security strategy before an attack like this hits. Phishing getting laser-focused? Highly targeted ransomware attacks? Continued cryptojacking? Evil AI-based attacks? With 2018 coming to an end, it's time to dust off the crystal ball and see what 2019 has in store. In this thought-provoking webinar, KnowBe4's Founder & CEO, Stu Sjouwerman, along with Chief Evangelist & Strategy Officer, Perry Carpenter, will take you into the future of social engineering and cybercrime. Stu and Perry will give you a run-down of the big themes of 2018 and then dive deep into their predictions of what you need to prepare your organization and people for next year. You can't afford to miss this one. We’ve mentioned this before, but the misconception has surfaced again, and it’s worth mentioning again. Looking for the padlock as a sign of a secure legitimate website isn’t an accurate indication that a site is malware free. Recent research indicates that nearly half of all phishing sites display the padlock and a web address that begins with https. Data from PhishLabs show that 49% of all phishing sites in third quarter 2018 had the lock icon. This is up 25% from a year ago. Since a majority of users take “look for the lock” to heart, this new finding is significant. 80% of the respondents to a PhishLabs survey believed the lock indicated a legitimate and safe website. Remind employees that the https portion of the address signifies that the data being transmitted is encrypted and so can’t be read by third parties. The padlock itself signifies nothing more than this. Its appearance may mean nothing more than that criminals are just lending some bogus credibility to their site. You told us you have challenging compliance requirements, not enough time to get audits done, and keeping up with risk assessments is a continuous problem. We listened! We have expanded the existing KCM product with new Risk and Policy Management modules, transforming KCM into a full SaaS GRC platform! Join us Wednesday, December 12th at 1:00 PM (ET), for a 30-minute live product demonstration of the new KCM GRC platform from KnowBe4. See how you can simplify the challenges of managing your compliance requirements and ease your burden when it’s time for risk assessments and audits. Quick implementation with pre-built requirements templates for the most widely used regulations. NEW Simplify risk management with an intuitive interface and simple workflow based on the well-recognized NIST 800-30. You can assign responsibility for controls to the users who are responsible for maintaining them. Secure evidence repository and DocuLinks giving you two ways of maintaining audit evidence and documentation. Dashboards with automated reminders to quickly see what tasks have been completed, not met, and past due. PS: Check out the *new* position that KnowBe4 has in the new Gartner Magic Quadrant! The bank isn’t always responsible for making you whole after a business email compromise. Indiana’s Lake Ridge Schools lost more than $120,000 from a seven-million-dollar construction fund established to build an athletic complex. The funds were stolen via a wire transfer ordered through a hacked email account. That account belonged to a business manager who was authorized to request payments. The money was requested in the form of wire transfers to several people thought to be contractors on the project. Ransomware attacks are increasing, and as a result, there will likely be a shift in brokers and clients alike starting to recognize the value of the business interruption component of a cyber insurance policy, a specialist insurer said Monday. “Cybercrime and theft of funds is still largely our largest source of claims by frequency on the business interruption side as a result of ransomware,” said Lindsey Nelson, international cyber team leader with CFC Underwriting. Privacy breaches as a result of a hack constitute only 12% of the insurer’s claims activity. While cyber discussions often revolve around privacy, ransomware attacks appear to be on the upswing. Think about the cyberattacks on the Ontario municipalities of Wasaga Beach and Midland earlier this year, and the recent one in Mekinac, Que. in which the region’s servers were reportedly disabled for about two weeks. In addition to hacktivism, email flooding is again being used as a smokescreen for more dangerous phishing techniques such as business email compromise, spear phishing and malware. Criminals use the email flood to distract victims and to exhaust security resources while they perpetrate fraudulent transactions. By the time the targeted person or organization clears the clutter and discovers the legitimate emails notifying them of account changes or suspicious activity, the attackers have made off with the funds. An old attack technique is now making its way back into the mainstream with an onslaught of messages that legacy tools and script writing can't easily detect. Imagine your inbox receiving 15,000 messages over the course of just a few days. What would certainly be an extreme nuisance could also translate into a huge productivity and operations liability, taking days or even weeks to return your primary method of communications back to normal. In a Nutshell: Targets in the UK are sent an email with an attachment named Brexit 15.11.2018.docx. If they open it, they're met with jumbled-up text and a claim of an error relating to the document being created in an earlier version of Microsoft Word. Next, users are urged to 'enable content' to see what the document claims to contain -- but if they follow through with this request, it enables macros and allows malicious-macro-enabled content to retrieve and deliver malware. The malicious payload is Zeboracy, a trojan that has previously been observed being deployed as part of cyber espionage campaigns working out of Russia. UK's departure from the European Union appears to be the latest in a line of current affairs topics which Russian hacking group Fancy Bear -- also known as APT28, Sofacy and a variety of other names -- is using in an effort to trick targets into opening emails and downloading malware. It's believed that the campaign has actively targeted government departments -- particularly ministries of foreign affairs, political think-tanks, and defence organisations across Europe. "The threat group is likely to be seeking access to insights on the latest political affairs, including confidential documents on national interests related to current news headlines such as Brexit," Michael Yip, security principal at Accenture Security's iDefense Threat Intelligence, told ZDNet. Fancy Bear has been linked to a number of high-profile cyber campaigns in recent years, including the cyber attacks and disinformation as a means of interference around the US Presidential election. "Yep, we’re doing just fine. Ran our first phishing campaign, and it went exactly as I predicted, right down to the percentage point. We will be revealing the results to our company on December 5. Already have a group policy ready to go to install the Phish Alert Button, and will engage our staff with a little phishing identification contest in January. Live in Europe? 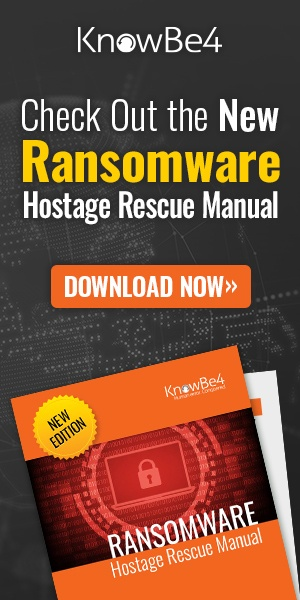 KnowBe4 Wants to Know What Keeps You up at Night! IT Pros today have lots of security concerns such as ransomware, external attacks, data breaches and compliance mandates. Some issues you have locked down tight, while others are making you crazy! We want to know what aspects of IT security you have covered, and which ones have you worried sick! In this fast, 5-minute online survey, we want to hear about what issues are of great concern to you and your organization. Marriott Breach Exposes More Than Just Customer Info. Did They Get In With Phishing? Prepared in cooperation with the CyberWire research team. And here is a 10-hour version! Copyright © 2014-2018 KnowBe4, Inc. All rights reserved.